The Gardens are open to the public for special events during the year. 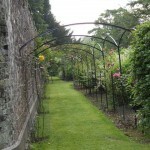 You can explore the beautiful gardens and river walk and visit the walled garden nursery to view the display borders. Plants are available for sale. A ceramic and sculpture exhibition by a talented local artist is also open in the castle pottery near the walled garden www.wynabbot.com. Cushions, scarves for sale in the castle drawing room from Heather and Fell and Ark glass will be exhibiting their wonderful hand crafted glass. Tea & coffee and cakes will be available on site. Further refreshments are available in the village institute and post office tea rooms. 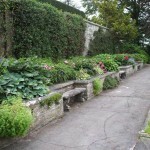 Come and have a cup of tea in the walled garden. We welcome dogs, but please keep them on leads and clear up after them. 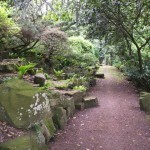 There are some lovely walks around the garden that everyone including your four legged friends will enjoy. 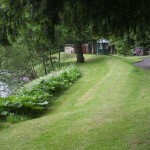 Being built on a hill, disabled access to the castle is very limited, there are a number of tarmac paths, however they are mostly very steep to access, whilst we do our best to ensure we can provide some disabled parking this is very limited and is at the bottom of the drive – it does not take you up to the main house. The same applies to pushchairs, whilst you can (and I have) push a pushchair all the way around the garden, the paths aren’t really pushchair friendly although people do manage especially with the hardier types of pushchair. There is parking in the village. There is no parking at the house or in the grounds, unless we have had a very long stretch of dry weather, when the car park will be signposted through the main gates. There are talks at 12 noon & 3pm in the drawing room by Sue Bull on the history of the castle, this is an informal and informative talk on the previous residents of the house; a brief history of the individuals and families and how they came to live at Hornby Castle.